Last weekend, even though I was still getting over my cold, I went to a casting workshop at Artisan's Asylum. And it was amazing! I hadn't seen the new Asylum space yet, and it is so great. Overflowing with maker-ness and beautiful art and crazy projects and a sense of community everywhere. Like the best parts of a machine shop, a hippie co-op, and an artist studio all mixed together. 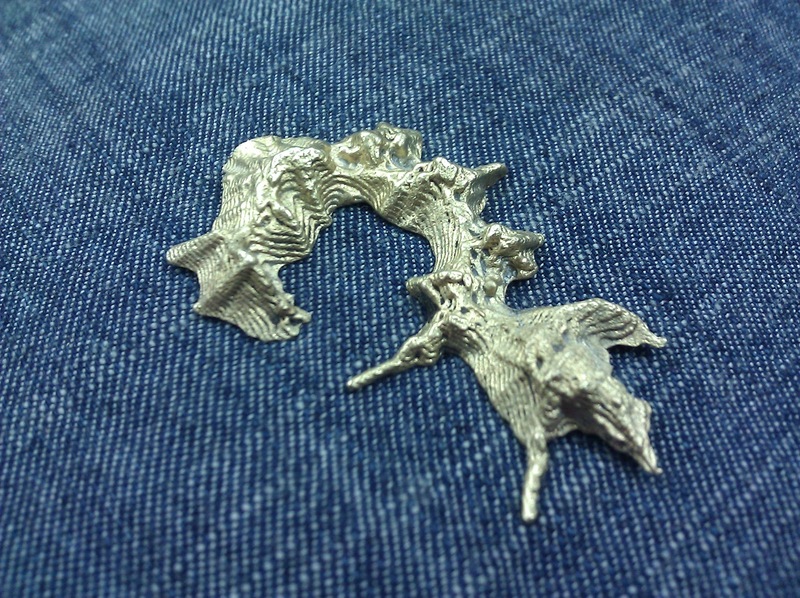 In the casting class, we melted bronze with a REALLY HOT TORCH. It was oxygen/acetylene! I am very covetous of this torch. So much so that I'm considering joining the Asylum just for occasional access to that torch. 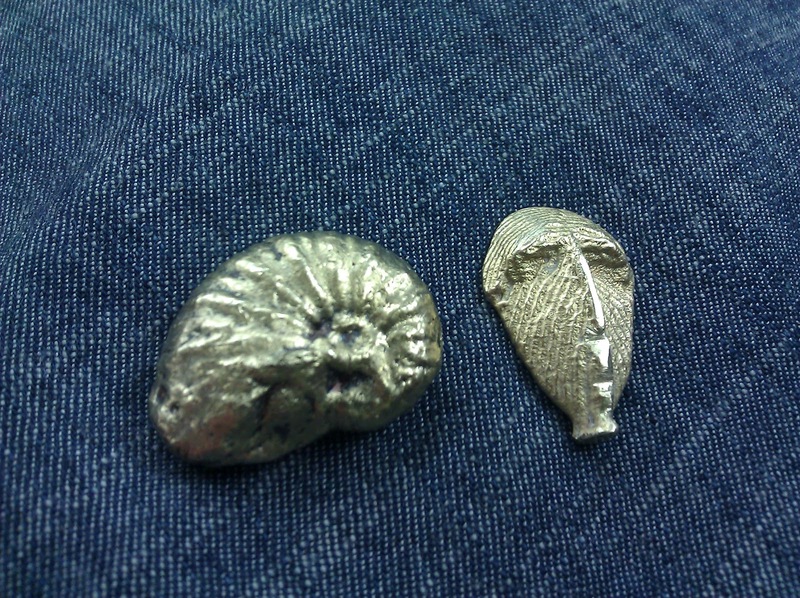 The ammonite on the left is duplicated via Delft clay. 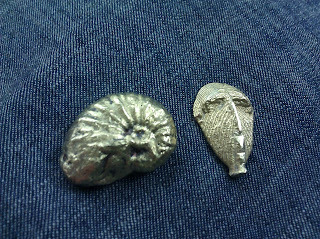 The face on the right was a semi-accidental shape made with cuttlebone casting--I tried to carve a trilobite, but missed, and it looked like a face because brains are good at seeing faces. So I did a bit of shaping with a file to enhance the face-ish-ness. Seeing that cuttlebone carving can be a bit unpredictable, I of course turned to making continents. I really love the way the cuttlebone ridges lend a topo-map feel. I hope to make more things like this! Whenever this happens, I always imagine that my body is playing a tower defense game--setting up my immune system to defend me from waves of oncoming yuckiness. In honor of me being sick, here is my brief overview of tower defense games I've loved. They're just the right balance of casual gaming (click buttons! see pretty explosions! make numbers go up!) and strategy for me. These links are to reviews on other sites, because I don't feel nearly as eloquent as the reviewers right now. Right now I'm playing with color. 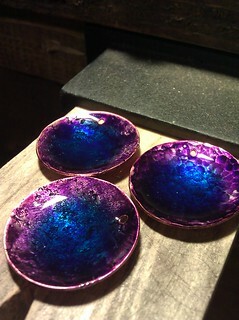 These test pieces on the left are using two colors of Adirondack brand alcohol inks, with Ice Resin as a sealant. I'm really loving the intensity of color that I can get out of these inks. I'm definitely one of the people who gets "drunk on color". At the local art supply store, I savor each hue in the aisle of colored pencils. I need bright green in the winter and on grey days, whether in the form of a salad or a blinding lime-colored shirt. And I'm simply hopeless in a yarn store. As I wait for more shades of ink to show up on the UPS truck, I'm scheming about the ways I might use color in my jewelry. What if I wasn't confined to using the colors I can find in my gemstones (shiny though they are), but could summon any combination of hue and shade at will? I'm thinking of tidal pools out west and the water in Riven. Of deep gazing pools and of ponds lined with glittering pebbles. Of all the ways I can bring together the highbrow art of metalwork and the playful, down-to-earth craftsyness of ink and resin. 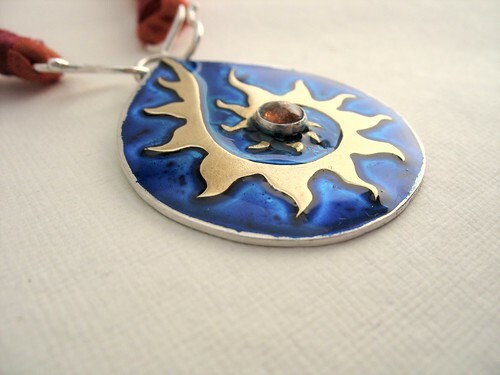 The pendant that started it all--a custom order, for someone who asked if the background could be blue.